One of the most beautiful and colorful areas of the sky, the nebulae surrounding Rho Ophiuchi display a wide range of cloud phenomena. 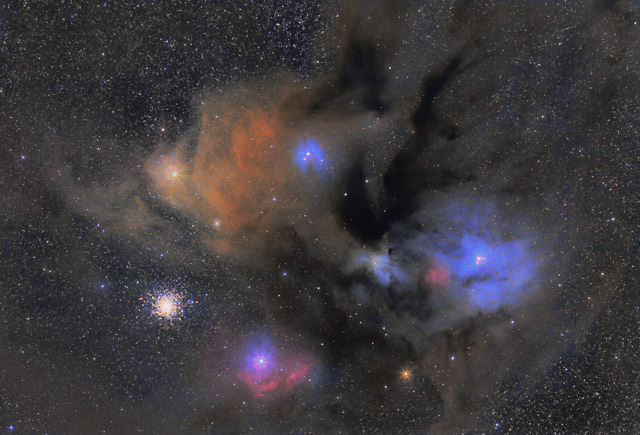 Rho Ophiuchi is the bright triple star at the right of this image that is surrounded by the blue reflection nebula, IC 4604. At the bottom of the image, the blue star Sigma Scorpii is surrounded by an intense red hydrogen emission nebula. To the upper left of Sigma Scorpii is the large globular cluster M4. Despite its apparent association with the surrounding nebulae, M4 is actually a much more distant background object. The image features a second globular cluster, NGC 6144. This smaller globular cluster is to the upper right of M4. Like its larger cousin, NGC 6144 is also a background object. To the upper left of NGC 6144 is the brightest star in the image, the red supergiant Antares. The name Antares means "rival of Mars", and visual observation makes it obvious that Antares has a reddish yellow color very similar to the planet Mars. Antares is so large that, if it were at the center of our solar system, its outer atmosphere would reach to the orbit of Jupiter. Antares' strong stellar wind has created the relatively cool yellow nebula IC 4606 that seems to engulf the star. On the right side of the nebula IC 4606 is another blue reflection nebula, IC 4605. This nebula is reflecting the blue light from the star it surrounds. This amazing field of view is punctuated by part of the the dark nebula B44. Commonly known as The Dark River, this nebula is created from dust that is in front of the surrounding nebula and causes us to see it in silohuette. Software Used Images Plus 5.0 for camera control, calibration, stacking, digital development, ArcSinH stretching, star shrinking and halo reduction, smoothing and noise reduction. Photoshop CS5 used for levels and curves, high pass filter, star shrinking, screen mask invert, lab color, vibrance, saturation adjustments, selective color, and match color. HLVG for addiitonal color correction, Gradient Xterminator for gradient removal. Carboni Tools for additional noise reduction, and smoothing. Registar for aligning stacks and for color channel alignment. Focus Magic for focus restoration. Notes This is such a beautiful region of the sky, it was quite a joy to capture. However, processing the image proved to be very challenging. While the colors are extraordinary, I found it very tricky to have a well saturated image while trying to maintain a natural look. I'm generally happy with the image, but I may attempt a reprocess somewhere down the road to see if I can make a few improvements. This image won Cloudy Night's April 2013 DSLR Image/Sketching Contest.